This course is intended for people who are confident with spectrum analysis but who wish to push on and learn more about signal processing; time waveform and phase analysis; cross-channel testing; machine dynamics; fault correction; and more. Monday – Thursday : 09:00 – 13:30 – 14:30-19:00. Friday: 09:00 – 11:00 Exam 11:00 – 15:00. If you are Category II (or Level II) certified and are ready to take your career and responsibilities to the next step, and you wish to truley master vibration analysis, diagnosis and correction, then this course is ideal for you. The Mobius Institute course and certification program follows the ISO 18436-2:2003 standard and the ASNT Recommended Practice SNT-TC-1A. Mobius makes it unique. 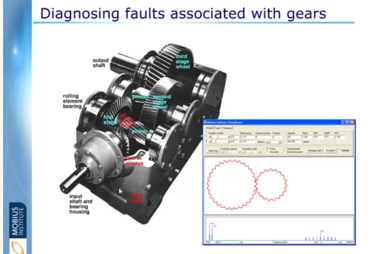 We use 3D animations, Flash simulations, and numerous software simulators that completely demystify vibration analysis. While vibration training courses have traditionally been very theoretical, difficult to understand, (and boring), you will be captivated by the Mobius Training methods, and you will enjoy our practical approach. You will take away skills that you can immediately apply to your job, and you will truly understand what you are doing. When senior vibration analysts attend our classes they often say “if only I could have learned this way when I got started” – well, now you can! Sitting and watching an instructor can be boring… When the instructor is using modern slides, 3D animations, and incredible simulators, there is no way that you will be bored, however there is nothing like hands-on participation. In the Mobius Institute courses you can use the simulators, and you can collect readings and study real vibration patterns. There is no doubt that the simulators make it easier to understand the topics we cover – but when you can use them yourself, the learning is further accelerated. Workbooks provide feedback – do you really understand? We also provide quiz questions that help you check if you really did understand the topics, and that you will be able to make the right decisions in the field (and in the exam). Every morning we have a lively discussion as we go through the questions. Before you even start the course you can visit our Learning Zone Web site to take the self-paced iLearnVibration lessons (and read through the manual). These lessons will help prepare you for the course – you will learn so much more if you go into the course with this knowledge. During the course you receive a pocket reference guide (a very handy booklet); a mouse pad that is covered with classic spectra representing common fault conditions; the famous Mobius pen that has a pull-out sheet of common fault conditions, an activity book of sample questions and answers, and our new 400+ page Category I manual. This new manual is easy to read, is filled with illustrations, follows the course slides exactly, contains an excellent “Equipment Knowledge” appendix, and can be used as a reference in the future. For six months after the course (or longer for a small fee), you can continue to access the iLearnVibration self-paced material on the Web site. If you forget something that you were taught, or you just want a refresher, then just jump on to the site and go through the fully narrated lessons. Can we prove the existing of a natural frequency? How does modal analysis differ from ODS?